"Hey Kowalski, you out there?" He was, indeed, as of March, 1971, and instantly the theatre crowds were out there as well, packing the local Salisbury movie houses and drive-ins for twelve different engagements over a seven-year period. Barry Newman was Kowalski, the man behind the wheel of the white 1970 Dodge Challenger, and Cleavon Little was Super Soul, a blind DJ with a police radio scanner. 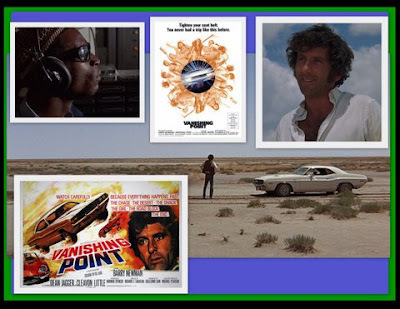 VANISHING POINT was action-packed from start-to-finish and had one of the quickest and most shocking endings in the history of the movies. "This radio station was named Kowalski, in honor of the last American hero to whom speed means freedom of the soul. The question is not when he's gonna stop, but who is gonna stop him."